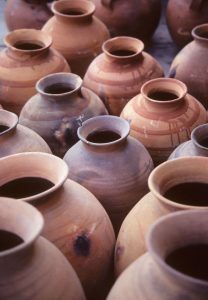 “But we hold this treasure in earthen vessels, that the surpassing power may be of God and not from us. We are afflicted in every way, but not constrained; perplexed, but not driven to despair; persecuted, but not abandoned; struck down, but not destroyed; always carrying about in the body the dying of Jesus, so that the life of Jesus may also be manifested in our body” (2 Corinthians 4:7-10). St. Paul today gives us a word of hope. Yes, he was speaking about persecution of the Body of Christ from outside forces. Perhaps, however, not all “outside forces,” for he acknowledges, “we hold this treasure in earthen vessels.” The Church is run by human beings, the “earthern vessels,” which we see can fail spectacularly, giving, of course, a justifiable reason for attacks from the outside. Today, we are “afflicted,” “perplexed,” “persecuted,” and “struck down,” as much from the faults of our shepherds as from the outside. On the other hand, there is indeed hope. Hope that we will “clean up,” from the inside, and, in America, much has been done since the safe environment program beginning in 2002. In the meantime, sadly, many will lose the treasure of their faith. We are truly “perplexed” by what has happened. However, the Church remains always the vessel of Christ’s resurrection, “so that the life of Jesus may also be manifested in our body.” The Church of Christ is firmly founded on the faith of Peter, even though Peter himself denied Christ, and had to be rebuked by Paul at Antioch for his hypocrisy. Christ’s power shines through, as St. Paul proclaims, “For God who said, ‘Let light shine out of darkness,’ has shone in our hearts to bring to light the knowledge of the glory of God on the face of Jesus Christ” (2 Corinthians 4:6). Jesus, Lord and Savior, Son of the living God, is the treasure of the Church, and his life is manifested in us.